We’ve had the good fortune of watching numerous companies create and update their customer service training programs over time. It’s a fascinating exercise, and every single program has unique differences, problems, and focuses. Even with their differences—however—there’s one mistake we see companies make over and over that dramatically reduces the effectiveness of their training. It’s not the setting, the instructors, or the curriculum. It’s that they look at training as a one-time event, rather than an ongoing process. Most training programs involve a class where your customer service team gathers for an hour (or a day) for training. Or you’ll push out a video course through an online platform and require everyone to work through the materials by a certain deadline. When training is complete, everyone goes back to their jobs, and you assume they’ll retain everything they heard. You might think that a big training means people will learn a lot. Often, however, what happens is learners leave feeling completely overwhelmed. This feeling of overwhelm is one of the biggest reasons 70% of training is forgotten within the first five days. As a result, since employees aren’t able to fully remember everything from the training, when they return to their jobs, they typically go back to what they know (or used to do), or require managerial oversight for what you had hoped would become routine decisions. In the rush to present everything, we often teach employees concepts they’re not yet ready to learn. It’s like hearing a lecture on calculus before you’ve mastered basic addition and subtraction. The learners don’t know what to do with the material, and so they can’t remember or implement it. The critical information is what you’ll measure when the training is over. In most training environments, however, learners come away completely overwhelmed with new information. Overwhelm from a lengthy training program makes is far less likely your CS team will remember the critical concepts you need them to retain. Science tells us that repetition is essential to learning. 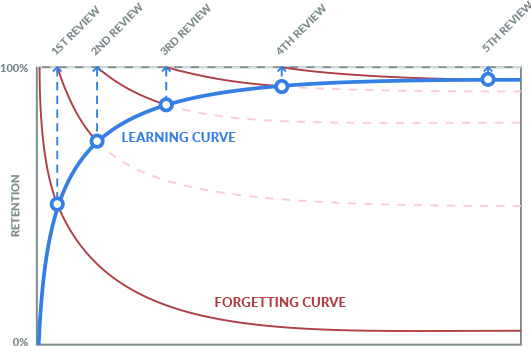 We can also predict how long it will be until a learner begins to forget information he or she “learned” in a training course. The trouble is: since most training courses are one-time events, there’s nothing in place to reinforce the new ideas and concepts. And so, the learner forgets. The first thing we do when designing a course is to break up the training into small nuggets. Instead of day-long seminars, learners get a little bit of information every day—that way they never feel overwhelmed. I know it feels good that you did all this work to collect, organize, catalog, and build lessons from the vast amount of knowledge in your company. Training programs are like closets. They need to be cleaned out every now and then to keep them from becoming cluttered. In our programs, learners are only exposed to a small amount of new information each day. The approach naturally allows a learner master the basics before moving on to more advanced topics. Since our learners aren’t overwhelmed, we can get much better results by prioritizing the most important information in the early stages of the training program. The “nice to know” information is presented later in the course. Our training programs are unique in that they use science-backed insights into learning. Our platform shows us what topics an individual is likely to forget, and when they’re likely to begin forgetting. In this way, we know exactly the right time to present a follow-up lesson on each topic. We follow-up with review lessons as many times as needed—until the learner has mastered the topic. If your training program overwhelms your team, they won’t learn even half of what you want them to learn. That’s a recipe for confused reps who can’t make decisions. It’s why CSAT scores are so difficult to improve, and it’s a big cause of churn in many organizations. However, if you develop a focused program, one that’s manageable and doesn’t overwhelm the learner and constantly reinforces the material, that’s how you get to a whole new level of quality in customer service.